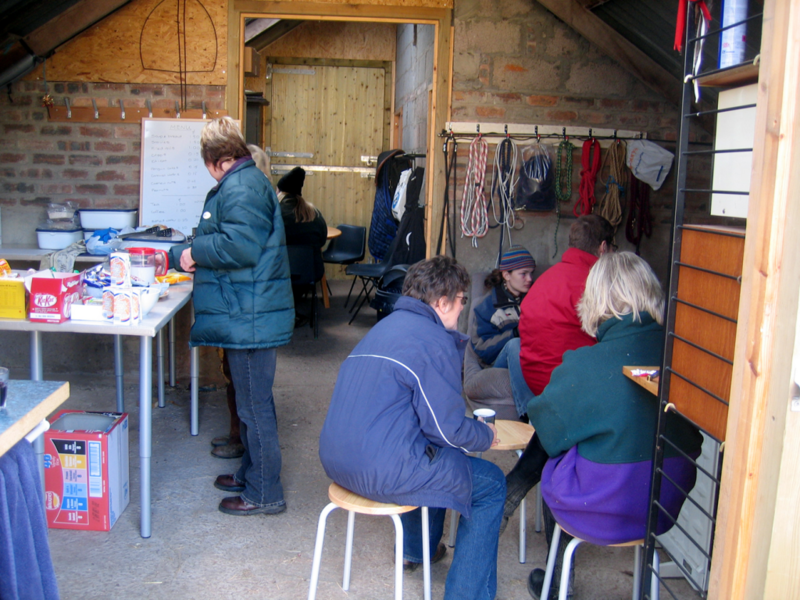 What we call the yard is a compact arrangement with car parking, 6 loose boxes, a hay/food store, water point, hitching rails and rings for 9 or 10 horses, mounting blocks, picnic tables and a toilet, all of which are in close proximity to the Howff and polytunnel. All of those facilities are covered continuously by a security camera system. 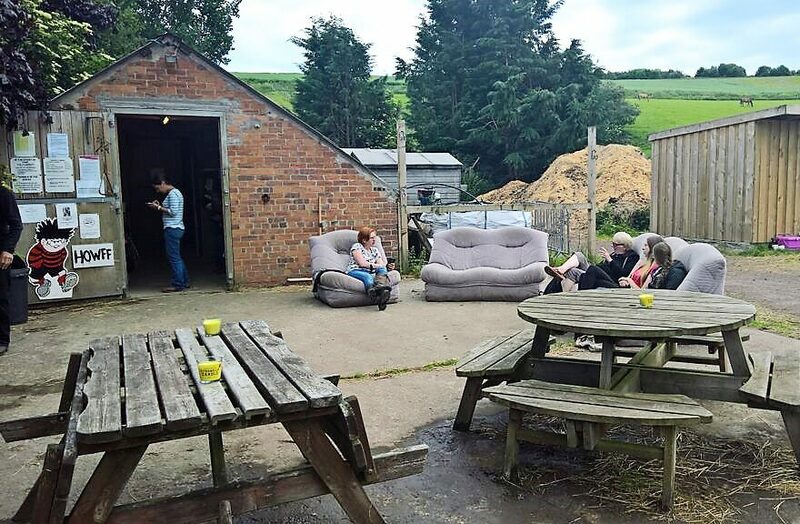 The yard is the working hub for all of the activities catered for on the 22 acres surrounding John’s home. The arena is 22m x 55m with a working surface of whinstone, crushed to between 5mm and dust. This surface is as close as we could get it to American desert dirt. It does not pretend to match the modern “reining” surfaces of washed sand on tarmac, but with regular harrowing we achieve 3 t0 5 inches of coarse sand over a compacted under-surface. This works well for western training and performance practice. Most commercial arenas do not have surfaces best suited to western disciplines. 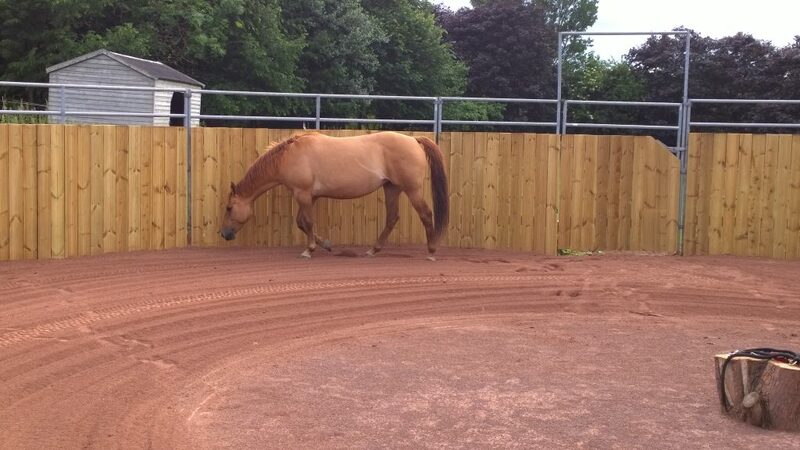 A round pen is an essential piece of kit in any western yard. It is a safe place where horses of any age and experience can be trained, and where people can practice what we know as traditional western training methods. People who, for whatever reason, have lost confidence in their horse handling abilities can regain that confidence in the safe environment of the round pen. The pen is 50 feet in diameter and is enclosed with an 8-foot-high fence boarded to a height of 5 feet. The ground surface is crushed whinstone to the same specification as the arena. This is a small but comfortably furnished space in which a lot of horse-related stuff like first aid kits, training aids, medical supplies, rugs, etc are kept and where teas and coffees and other beverages can be served. It opens directly from the yard and is in use every day. It is also the place where health and safety information, emergency services contact numbers and procedures are posted. 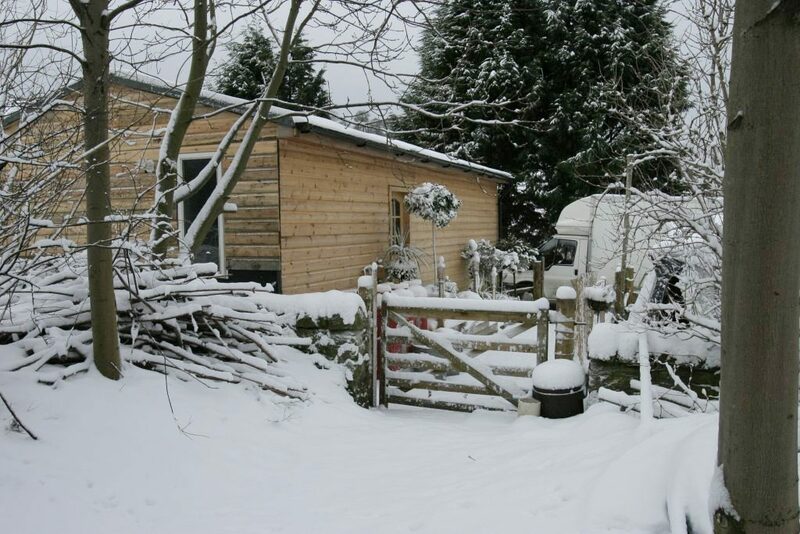 Kola’s Korner is a two-roomed, centrally heated hut with a shower/wash room and mini kitchen. It works as a classroom, rehearsal room, meetings room, partying room and sleepover space. It is also the warmest place on the yard to escape to in the coldest and wettest days of winter. Its covered terrace accommodates a wood burning fireplace and a barbecue. The tunnel was first introduced to raise plants for sale. It is 18 ft. wide and 90ft. long. 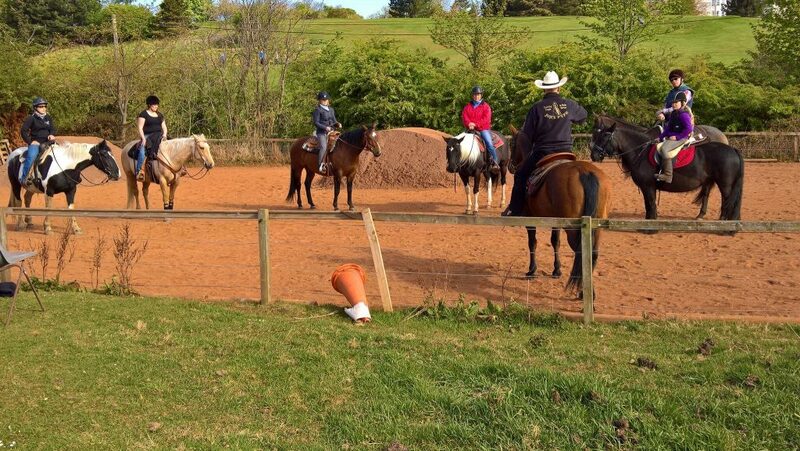 It has become a multipurpose space which is used variously for propagating plants, escaping to warmer climes when it is cold, windy and wet outside, raising chicks, parking horses and, when we have a trail trial show, it can be ridden through to impress the judge. 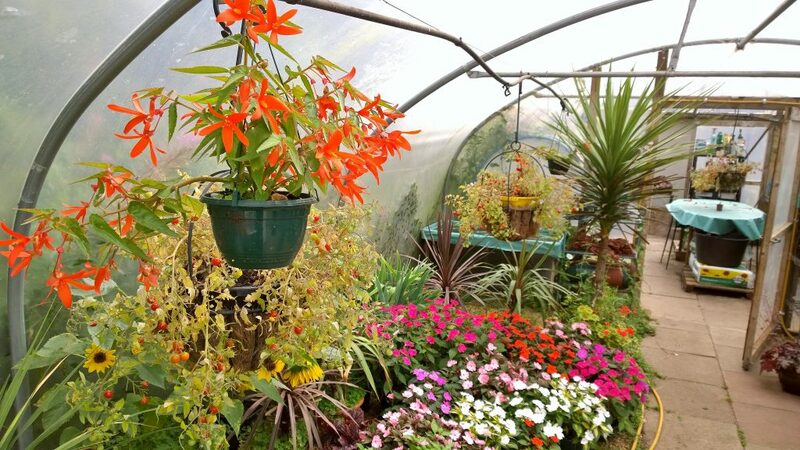 Its everyday function is as a place out of the weather to have lunch, surrounded for much of the year by flowers and plants which Margaret raises and attends.